Today I am bringing you a change from the norm with a 3D project instead of the usual cards! Yup, I am going crazy ha! Stampin' Up! offer such a wide range of products that you can use for gift packaging and one of the things that I really like are their Clear Tiny Treat Boxes. They measure 2" square, and cost £6.95 for 16 (that's 43p per box!) and are great for filling with sweet things to share on a table, or as a "just because" gift. I recently gave these out as teacher gifts alongside a card for Christmas. This treat box is filled with mints, which is great for the non-chocolate lover! I have added some strips of DSP from the new Picture Perfect Birthday 6" x 6" DSP stack around the box, leaving the top clear so the receiver can see what's inside, and tied with some ribbon and bakers twine to secure. 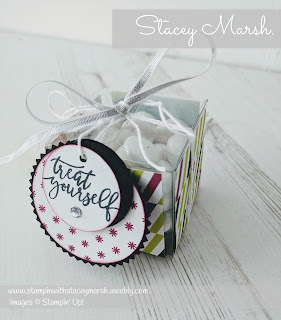 To create the tag, I have used a selection of punched shapes and a sentiment from the new Picture Perfect Birthday Photopolymer Stamp Set which is just perfect for these things, "Treat Yourself". As always, thank you for reading, have a great weekend!